• The spinal foramen openings that are between the spinal vertebrae through which the peripheral nerves leave your spine and then go to the other parts of your body. • The spinal canal that’s in the centre of your column of bone, which is known as the spinal column, through which your nerve roots and spinal cord pass. It usually results from the gradual, degenerative process of ageing of your spine. Spondylosis (osteoarthritis of your spine) is the most common type of spine arthritis, and it’s more likely to happen in middle-aged and older individuals. 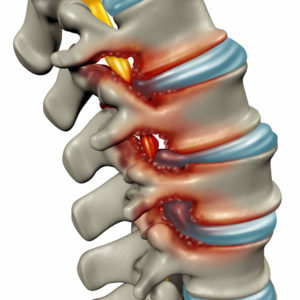 It’s a chronic degenerative process, and it’s the result of daily wear and tear of your spine joints, which is usually accompanied by overgrowth of your bone, bone spurs formation, which may cause spinal stenosis. • Claudication-type pain is very common; it refers to the pain in your legs that becomes worse with prolonged walking or standing. • Numbness, cramping, weakness, and pins and needles. • Referred pain down into your foot/thigh/calf. • Pain can either be one-sided or affect both sides at the same time. 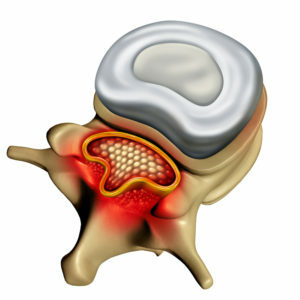 • Hip, back or buttock pain. Typically, the diameter of your spinal canal is improved when you are in flexed positions (for instance, bending forward or sitting down), hence these positions usually offer relief. Positions promoting the extension of your spine (for example, walking uphill, leaning backwards and standing) tend to narrow your spinal canal further, reducing the space for your spinal nerves. That’s why people who have stenosis usually find walking and standing for long periods hard, but they find sitting brings relief. • Manual Therapy – This will loosen your stiff muscles and joints, which will allow the vertebrae in your spine to have a better mobility, thus reducing the nerve impingement. • Postural Advice – Too much arching or lordosis in your lower back can end up increasing the level of stenosis. You chiropractor will teach you how to find your “neutral spine” or encourage a flexed posture (a slight slouch), which can bring relief. • Exercises – If you have stenosis, you can benefit from the stretching/mobility program that chiropractic offers to loosen your lower back, especially exercises that flex your spine, which encourages an “opening” of your canal to make more space for your neural tissue. If you have stenosis and need a highly experienced chiropractor in the Mt Pleasant, Scarborough or Applecross suburbs of Perth, visit Spinescan.